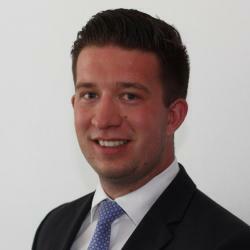 Stefan is currently working for Patrimonium Asset Management AG in Switzerland. Previously, he worked for a VR bank and savings bank in the financial advisory and completed part-time BSc for professionals at the Frankfurtschool, as well as the CIIA at the DVFA. Despite a full-time job in banking, the Frankfurt School enabled me to lay the foundation for a promising career in the financial industry. You think 40 hours of work and then university, isn’t manageable? Sure, it’s possible. No business school can accommodate as well as the Frankfurt School to master the narrow degree of combining a university degree and a professional activity. You benefit from highly motivated teachers at Frankfurt School, and the learning content is always actual and up to date. This expertise could be put to the test in the daily working hours and prepares you for almost every troubleshooting at work. After successfully completing my Bachelors degree (BWL for Professionals), the application phase was an adventure for which I had the necessary tools thanks to my studies at the Frankfurt School. Through numerous case studies, I was well prepared for the application process in corporate consulting, corporate finance or asset management. My journey not only took me through Germany, but also to beautiful Switzerland. In the lake Geneva region, at Patrimonium Asset Management AG (“PATRIMONIUM”), everything finally came together. The chance to work in one of the most important financial centers in the world, to gain foreign experience, and at the same time to have a front row seat in the fast-growing market of private debt, finally convinced me to move to Switzerland. Unfortunately, private debt does not yet enjoy the status in Europe as it does in the USA, but this is where the opportunity lies. PATRIMONIUM is an asset manager for alternative investments. In addition to real estate and private equity, PATRIMONIUM was one of the first in Europe to engage in private debt. I joined PATRIMONIUM as an Investment Analyst. From the beginning I was able to take on responsibility and to take on my own projects. No working day follows the same routine, which makes every day a new little adventure. Cooperations with medium-sized companies in the DACH region require everything you have learned during your studies. Whether during the due diligence phase or while analyzing financial documentation. If the investment committee, and board of managers are confident and the investment has been made, the monitoring and reporting phase begins. This way, you follow a project throughout its lifetime. Many companies speak of flat hierarchies and open-door politics. Here at PATRIMONIUM we are one step ahead. Whether analyst or managing director, everyone is sitting next to each other. This not only shortens decision-making, but also gives your learning curve an incredible boost by benefiting from the knowledge of more experienced colleagues. Do you want to quickly put your knowledge on the test, take over responsibilities and work with a young, enthusiastic and professional team? Then get in touch with us. Meet PATRIMONIUM and other companies at the FS Career Day!